So continues to part 2 of The Cincinnati Enquirer feature on me & my quest for the best gluten-free food ever. The good stuff now, the recipes. When I first discussed this article with the food writer, Polly Campbell, we wanted to pick recipes that were summer-seasonal, easy for the average home cook, and appealing to everyone regardless if they have to eat gluten free or not. We thought corn dogs, quinoa tabbouleh, and PB&J cookies fit the bill best. Click here for the PB&J cookie recipe. Give all these recipes a try and let me know what you think! "Even corn dogs can be gluten-free"
Even more important than new recipes, Erin Swing Romanos says, a new attitude is what people needing to eat gluten-free have to find. "You have to open your mind up to different grains (and) flours out there. Once you've expanded your mind and knowledge, you'll find it easier." And, she says, don't focus on being deprived. "Don't be caught up in what you can't eat, but think about what you can." While gluten-free products are improving, it may take some experimenting to find which ones are good. Meanwhile, you don't have to go to cooking school, but you do have to learn to cook. "It can really be a more wholesome way to eat. You'll be eating real foods, trying new things, not relying on packaged foods and eating out." Here are two of her recipes, including one for corn dogs, a guilty pleasure for many of us, whether we admit it or not. These are baked with a Brazilian bread mix of tapioca flour, which is nice and chewy. The "dog" can be your choice of hot dog, veggie dog, chicken sausage, etc. Just make sure it is precooked. If it is large, you may want to cut it in half lengthwise. In a large bowl, mix the chebe, corn meal, sugar, salt and garlic/onion powder until uniform. Add in the liquids, the milk, oil, egg (and cheese if desired). Mix with spoon until homogenous. Separate the dough into 6 portions. Put a chopstick into the dog, mold one portion of the dough around the dog until uniform and completely covering it. Repeat for all six. Place in oven and bake for about 20 minutes or until just golden brown. Note: Chebe mix and red quinoa can be found in the health food section of larger grocery stores. When I think of tabbouleh, I instantly think of summer with all the fresh herbs, tomato and lemon in it. It is somewhere between a salad/appetizer/side. Traditionally, it is made with bulgur wheat but using quinoa is a way to increase the nutritional content and make it more exotic. Quinoa (KEEN-wa) is an ancient grain from South America that is a complete protein with all the essential amino acids your body needs. In a medium sauce pan, simmer 1 cup quinoa in 2 cups water, covered, until all the water is absorbed, 15-20 minutes. Allow to cool before mixing with rest of ingredients. In a large bowl, combine lemon juice, chopped tomatoes, green onions, parsley, mint, salt, pepper, cinnamon and olive oil. Toss with spoon until all is incorporated. Add in the cooled, cooked quinoa and toss until evenly distributed. 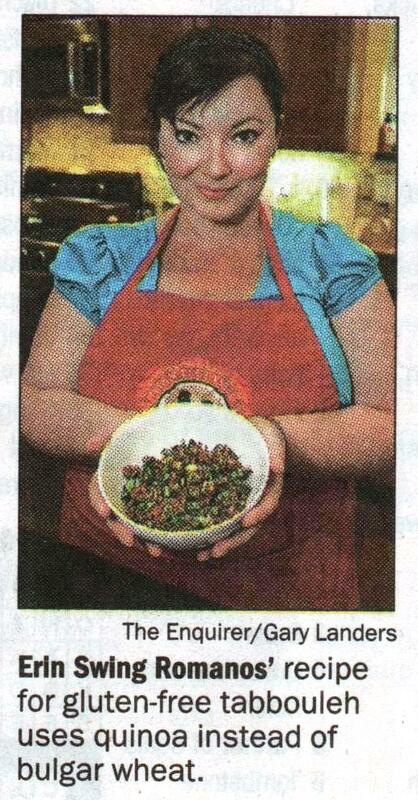 Here is the close up of the finished red quinoa tabbouleh.